Re-imagine your backyard with a beautiful pool & spa professionally designed and expertly built by one of Utah’s best swimming pool contractors. 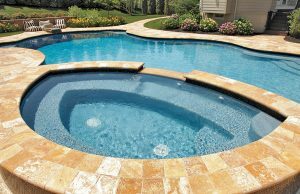 Blue Haven builds concrete pools (also known as gunite pools), as well as fiberglass pools and major pool renovations. 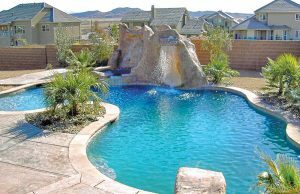 We provide pool construction services in the Salt Lake City/Provo region and throughout the state, and our team can build the aquatic retreat and all the backyard amenities that are perfect for your family and lifestyle. Choose from a full spectrum of inground pool designs: From a tropical, boulder-studded lagoon with a beach entry, to a contemporary, straight-edge configuration with sleek cascade water features, you can have any kind of pool & spa design for your personal tastes and inground pool budget. Here in the Beehive State, you can have virtually any size, shape, or configuration of pool. Include a range of decorative and functional features as well, from tanning ledges to rock grotto waterfalls. 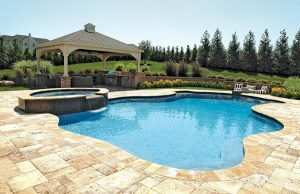 And when it comes to what surrounds your backyard pool, you also have plenty of choices. Select from a variety of deck-material options, including brick, pavers, flagstone, poured concrete, and stamped & decorative concrete. A new deck can also enhance backyard living: Our specialists can configure your new hardscape with activity areas and features that boost functionality, such as steps, fire pits, walkways, plateaus for seating and dining, and built-in barbecues. A key advantage we offer our pool clients is an alternative purification. Instead of depending on harsh chemicals to maintain water quality, you can have our SmartPure Duo technology ensuring a more comfortable swim environment. The Duo system use two gentle but powerful technologies: ozone and UV germicidal light. Together, they attack a wide spectrum of disease-carrying pathogens in pool water as it passes through the pool equipment—away from the pool. The result: a gentler, more pristine swimming environment. Another way to improve swimmer’s experience is by tackling hard water. Some Utah communities face high mineral content in the water supply. Elevated levels contribute to the build-up of ugly mineral scale along the tile line and any stone work. However, our SmartGuard Soft & Clear system helps prevent this unsightly accumulation—reducing the need for brushing down pool walls. Utah is the second-driest state in the country, so responsible use of this precious liquid resource is critical. Blue Haven’s state-of-the-art pool equipment helps in this effort, and it’s why we use only cartridge-type filters. Why does the type of filter matter? Because unlike DE and sand filters, cartridge models do not require backwashing—a process that can waste hundreds of gallons of pool water a year. Along with significant amounts of valuable pool water, cartridge filters are easy to maintain. With their massive dirt-holding capacity, Blue Haven’s super-size filters need cleaning only once a year on a typical Utah pool. Another water conservation strategy we offer: automatic pool covers. Using a cover is the number-one tactic to save water. A cover can greatly slow the pace of water evaporation—particularly on hot Utah days and cold desert nights. Research shows that they can slash evaporation by 95 percent! In addition, pool covers greatly enhance safety if you have small children. Covers also help keep your pool cleaner and warmer. Get started today on your new inground pool & spa. Request a copy of our free photo-filled, color brochure, or call for a free, in-home pool estimate and design presentation for a pool tailored to your backyard.